The REBOUND® refill packages come with everything you see here. BioMedical Life Systems, Inc. recommends replacing the electrode pads once they do not stick well or they have been used for more than 30 days. 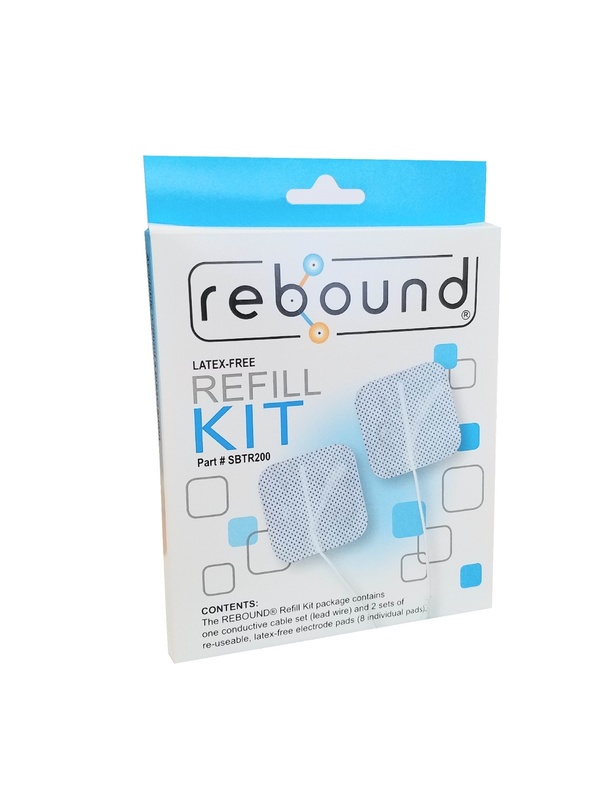 The REBOUND® Refill can be used for either the REBOUND® Health or REBOUND® Sport devices. Each package contains one conductive cable set (lead wire) and 2 sets of re-usable, latex-free electrode pads (8 individual pads). Each package contains one conductive cable set (lead wire) and 2 sets of re-useable, latex-free electrode pads (8 individual pads). Hair should be removed where electrodes are place for better adhesion and longer pad life. Turn Off TENS Unit or Other Therapy Unit. Usage of an Electrode Not Recommended by the Manufacturer may have adverse effects. Electrodes could last as long as 2 weeks more or less. Factors such as skin type, skin condition, skin preparation, humidity, hair and well a other factors all play a role in the life of an electrode. Electrodes and Lead wires are consumable items and are not meant to last a lifetime.